Budgeting has always been one of the many things that a lot of people struggle with. We just have so little money with so much to spend on and they mostly want and not necessities. While budgeting may be regarded as one of an adult’s greatest hurdles, it can never be too difficult with the use of monthly budget samples and a lot of discipline. 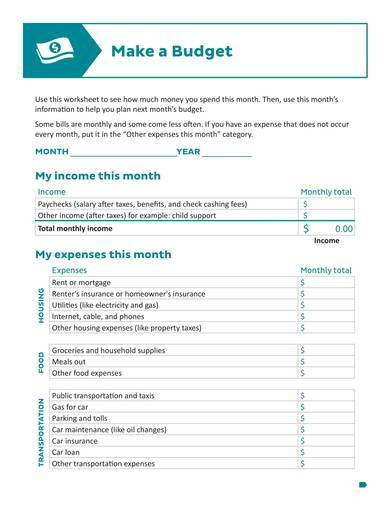 Here are some monthly budget samples that you can use with some steps on how you can create your own monthly budget. 1. Take note of your net income. 3. Make a list of your financial goals. 4. Make a plan and strictly follow it. 5. Regularly check your budget. Starting your own monthly budget is made easy with the use of the steps listed below. Make a list of all your expenses and categorize them accordingly. Keeping track of your expenses will help you decide on where you can make adjustments or make changes to fit your budget planner. Identify your short-term and long-term goal plan on what you want to achieve. It is also important to set the goals that you think are priorities. Review and update your budget regularly so that you can stay on top of your monthly expenses and ensure you are not going over your allotted budget for the monthly budget sample. 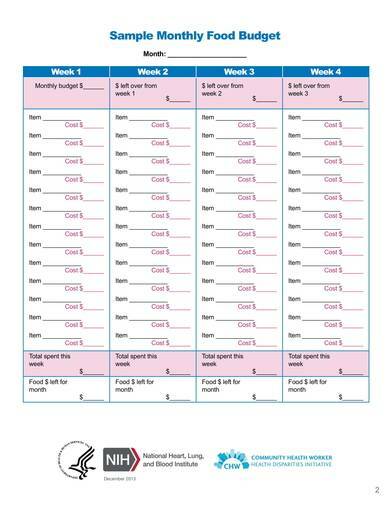 This monthly budget worksheet is a great way to keep you on track with your monthly budget. The worksheet automatically totals your numbers allowing you to easily make the necessary adjustments on your budget. You can either make a cut on your expenses or increase your income so that you can reach the amount you have planned on spending plan. 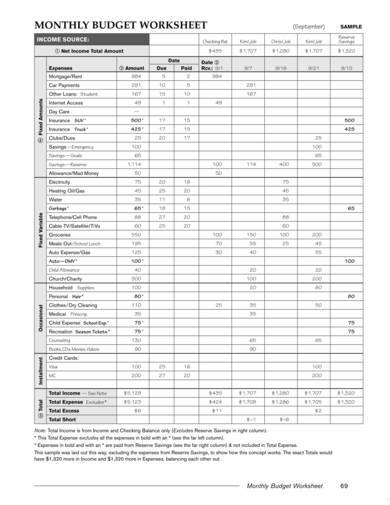 This blank monthly budget worksheet sample divides your expenses into four categories, namely fixed mount expenses, fixed variable, occasional expenses, and installments. With this worksheet you can keep track of your paid and unpaid bills, and the dates when they got paid or their due dates. 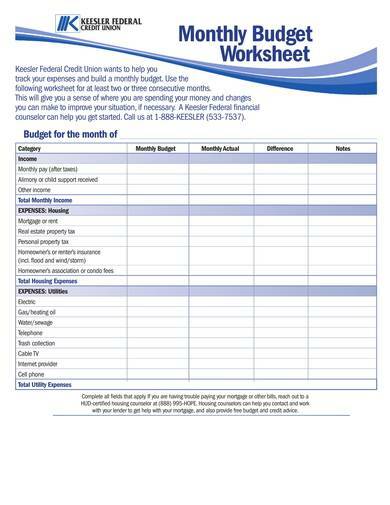 You ca have two or more individuals added in this blank monthly budget worksheet plan. Adulting may be hard, but it can be made easier if you properly budget your income and plan your expenses. 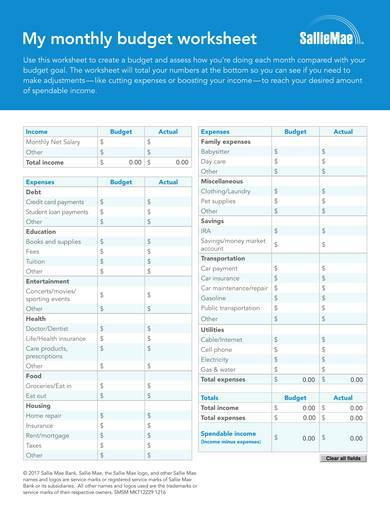 Whether you are single or supporting your own family, you can use this monthly budget sample template to help you budget your income to make sure it is enough for your expenses. You can also compare your estimated expenses with your actual expenses so that you can make adjustments with your budgeting in the future. You may also see Budget Calculators. Use this monthly budget template to help you budget your monthly income in a way that best works for you. Once you get the hang of doing monthly budgeting, you can slowly change to doing a budget for the entire year. This sample template is perfect if you are planning to save for your wedding budget or for your dream home. It’s very easy to go beyond your planned expenses, especially when it comes to food. Good thing there is a monthly food budget template that can help keep track of your food expenses so that you can never go beyond the allotted amount. 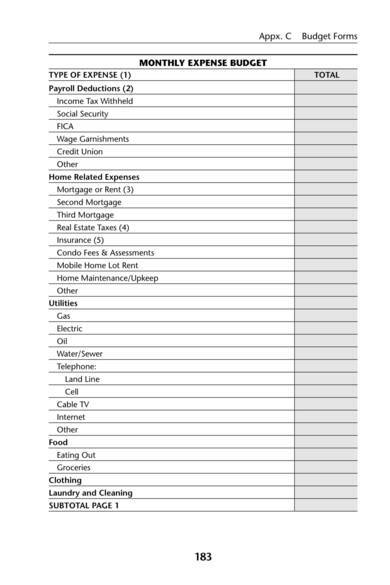 This simple yet detailed monthly household budget worksheet will make budgeting for your family easy and convenient to do. 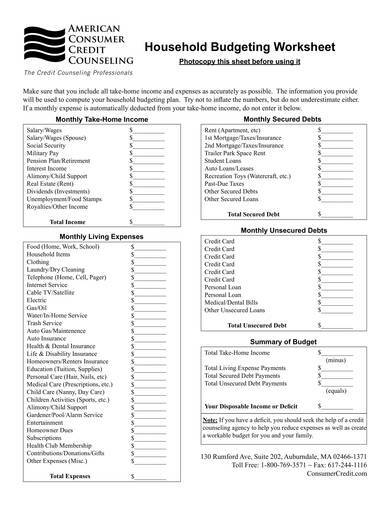 It includes details about your monthly take-home income, monthly living expenses, monthly secured debts, and monthly unsecured debts. 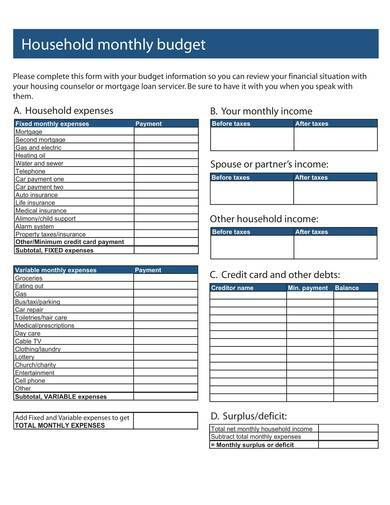 You can keep track of your entire household’s income and expenses with just a single sheet using this monthly household budget template. You can include here your parent’s monthly income or your spouse’s monthly income before and after taxes. 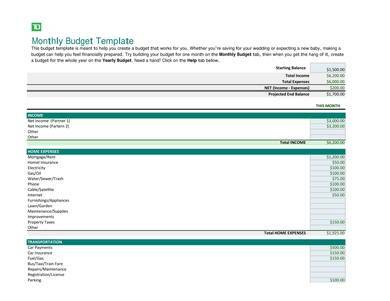 Looking for a simple and easy to use monthly budget template? 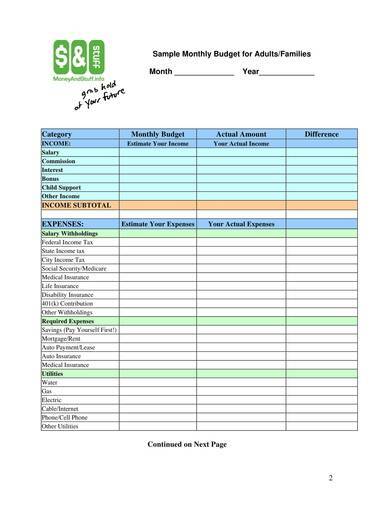 Then this monthly expense budget template is the one you have been looking for. Its simple but detailed design makes it easy for you to use and complete. 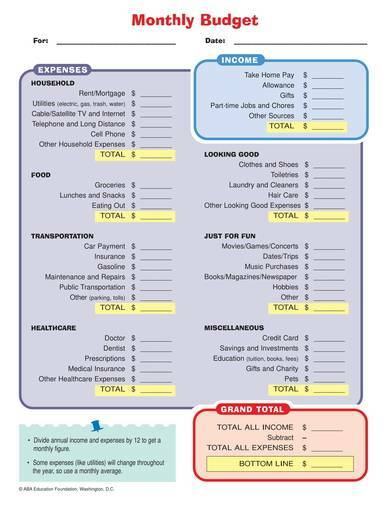 Print this template as many times as you want for your monthly budgeting needs. 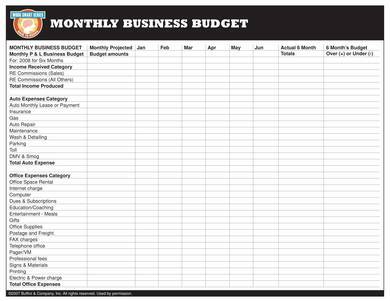 Using this printable monthly budget template will help you build an effective monthly begetting scheme that best works for you.